How does it Work:Yamuna® Body Logic creates space between muscle and bone, allowing the body’s perfect circuitry to fire in logical and correct order. This, in turn, allows the body as a whole to perform optimally. Through one session a practitioner works the entire body working every joint in every range of motion looking for restrictions and possible causes for the specific problem. The entire body is worked in most cases to see how the body has compensated and what all the parts are actually doing contribute to the pain or problem pattern. This hands-on therapy works to improve the quality of bone muscle, other soft tissue and alignment with every season. Three sessions are usually recommended to fully assess and begin structural corrections. YBR® Table Treatment is an adaptation of Yamuna's Body Rolling hands-on work. How is this treatment done? It’s done on a massage table using the ball on one side of the body while the practitioner works the other side of the body molding it and extending it around the ball. 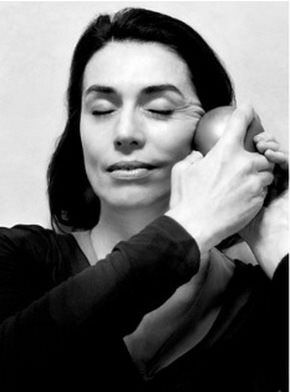 The therapist works the entire body applying gentle traction out from the joints down and around the ball. The results are greater range of motion in all the joints, a longer freer body, increased circulation and improved alignment. This treatment helps you save time in getting your results! Both sides of the body are being worked on at the same time. Instead of surgery, threading or Botox. With specifically designed Yamuna balls, we stimulate bone and muscle. Compression patterns are relieved. The skin lifts once again. And circulation improves, delivering more oxygen to the skin, combating the elements and enhancing vitality. As well, our whole body – not just our face – finds its natural order. The body is a vertically integrated organism, and as the face relaxes, our body feels more free and open, and our breath deeper.